SUMMARY: By expanding a brand-defining “Data Nerd” campaign during a yearly event, the New Relic marketing team built general market awareness and strategically involved customers in the brand's community. When they launched the “Data Nerd Photo Booth,” the team was able to see over 200 retweets during the event and had a 14% participation rate from attendees. New Relic is a software analytics company. "It's a category that we are pioneers in," according to Baxter Denney, Vice President of Online Marketing and Operations, New Relic. Denney explained the company has a series of products called the Software Analytics Cloud, and "these products deliver real time insights so that our customers can make critical decisions about their software, their customers and the way it impacts their business." 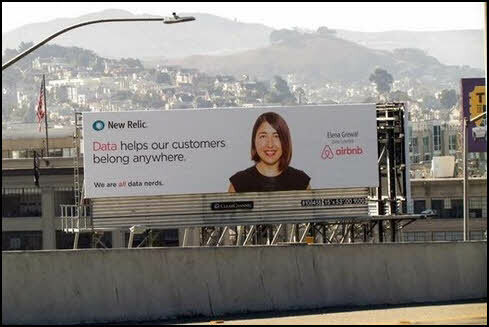 New Relic’s marketing needed to re-imagine an original "Data Nerd" campaign to be more inclusive of buyers across the enterprise without alienating or losing credibility with the core developer community. The company also needed to build general market awareness in advance of the company’s planned IPO in the fall time frame, which was limited by the SEC-enforced "quiet period." Through a strategic marketing approach that involved customers from a range of backgrounds and industries, New Relic remained true to the brand beloved by the community, while expanding the scope of the message. "We are always looking for ways to make our customers into ‘rock stars’ — in this case we wanted to find a scalable way to capture and share customer stories (including photos) at our annual user conference, FutureStack," Denney said. A cross-functional marketing team brainstormed ways to accomplish this, and came up with the idea of a "photo booth" that a creative team would staff, taking high-quality photos and then editing them in real time into a "We are all data nerds" billboard image. Each billboard was unique as the attendees filled in the "Data helps me _____" phrase, which was added to the billboard image. "What was great about this campaign is it put in the hands of our customers the ability to engage with us in a way that did generate goodwill and press and buzz," Denney said. The Data Nerd campaign is a big part of New Relic as an organization, Denney said, and the company wanted to find new ways to extend it. "It's how we relate to our customers. And you see that term kind of embedded through T-shirts that we have, through billboards and so forth," he said. "So we really wanted to extend this campaign and get our customers involved." The team then used the billboards as a digital asset to get customers engaged socially online as well as to "connect to them as an extension of the brand campaign and … then [as] an extension of the conference itself so it could continue to live on after they left the show," he said. The New Relic legal team was involved in this effort to assure the images could be used in later marketing efforts. "Other than that, that campaign itself was pulled together relatively quickly," Denney said. "This is something that matured very quickly as what we were talking about was to engage with our audience and ways to get people involved with our brand campaign." Coincidentally, the team then used the user conference as an event to rally this effort. This conference was also used as part of the impetus for launching. 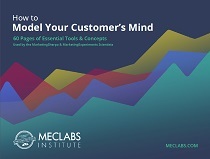 There was a cross-functional marketing team working on this Data Nerd effort, "a huge group," according to Denney, consisting of people from across the events, legal, creative, demand generation, lifecycle, Web and marketing operations teams. "All of them were working together to manage various components of it," he said. These teams worked on setting up the process to make it seamless for participating customers. This included recruiting people to come by the booth at the conference, getting them set up with the photo booth, processing the photos into virtual billboards and pushing the social media promotion of the Data Nerd campaign. "I think one of the things that was really cool about this campaign is, because we were able to share it on social media and people retweeted it and so forth, it had this word-of-mouth feel where people were seeing these billboards being tweeted out and were curious about it," Denney said. People at the event would see the picture billboards on social media, he said, and ask others how they could get one. They would also tweet at New Relic and be directed toward the booth. "It got to be one of those things that momentum built up, and all of a sudden, we walked in the second day, and there was a line 20 or 30 people deep waiting to get their photos taken," Denney said. Because the team had promoted during the first day, and participants had also tweeted and told others about the effort, people were able to see the result and wanted to be involved. "That was one of the cool things about having this campaign and making it so social and shareable for our audience," Denney said. New Relic is constantly engaged with customers on social media, he added, especially Twitter, which increases during campaigns and events. From a B2B perspective, he added, "[Social media] is tricky. It's something that we can always do better at, for sure. The key to us is to understand if a user at an organization is having issues or has legitimate concerns or is really happy with the software, making sure that we're listening to that and making sure that they're getting the appropriate level of support and follow up," he said. If a customer has constructive feedback, he added, it’s important to take that into account and consider it as part of the ongoing conversation social media facilitates. Even in B2B organizations, people expect an engaged social media presence. "The key is to make sure that your customers know that you're listening and understand that you're taking action around their feedback and making sure that you present a human face to it and make them understand you're not some monolithic corporation that doesn't care," Denney said. After the event, Denney said, "we looked at all of the tweets and mentions and so forth and all the activity we had gotten from it and ended up giving people an update after the show." A big takeaway from this effort, because it was so positively received by New Relic customers, was to "get our customers involved as much as possible. Being able to share their stories is so much more impactful than us just going out with a message," Denney said. Since customers who had participated in the event were some of the most engaged and active, the team wanted to prolong the social aspect of the campaign, even after the event concluded. Denney and a teammate had the idea to take the images, print them and send the framed "tiny billboards" to customers as a keepsake for their desks. 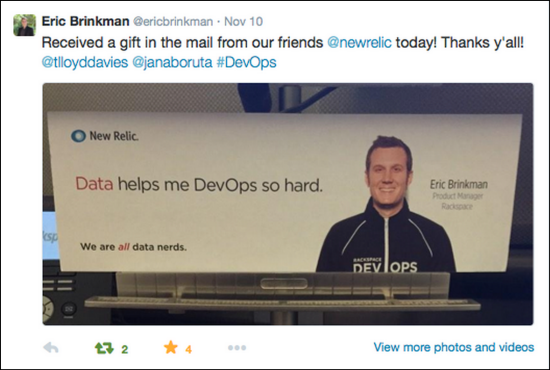 "[The tiny billboards] were something to remind them of the conference and their relationship with us at New Relic. It lead to further engagement in terms of tweets and mentions, and goodwill built up between us and our customers," he said. After the event, the team also made sure they had customers’ permission to put the photos on physical billboard placements in targeted cities. This effort was also put into a New Relic blog post. "So whether it be billboards or banner ads online or messages that we have at our events or what have you, we want to make sure that people understand the engagement that we have with our users and the customers that are happy using us and the value they're getting from New Relic," he said. New Relic has recently launched the next wave of this brand campaign in Las Vegas for Amazon’s AWS re:Invent event, Denney said, and is featuring real tweets from users about their experiences with the product. "I think that's kind of a cool, natural extension of what we'd done in the past," he said. "We're going to continue to get customers involved to the extent that we can in our campaigns and share their stories. That's kind of become a central tenet, and I could totally see us doing a similar type of photo booth experience or some kind of extension of that in future events." "We got lots of mentions from people, lots of submissions … it gave us a lot of great content that we could reuse," Denney said. Marketers, he said, are always looking toward moving on to "the next thing" or the next campaign. "What we demonstrated and what I think people could takeaway is that there are always these extensions from your campaign that you can look for, these tendrils and these threads that you can build on and construct off of. That's what's really cool," he said. Their team went from the idea of billboards with a "Data Nerd" message, he said, and "we transformed that into, we've got customers and users who are engaging with us. We're able to make them the stars of the show and bring them to the forefront and extend it to physical billboards to use this in multiple locations and different events after that." Marketers have to make relationships more natural, he said, to make the exchange with customers genuine and powerful. "I think often times marketers are trying to extract as much as they can from customers, and it's not really an exchange … By putting customers in the forefront, putting them on billboards, making them rock stars, I think it really gave us much more of a directional relationship throughout this campaign," Denney concluded. Baxter Denney, Vice President of Online Marketing and Operations, New Relic, will be speaking on this campaign at MarketingSherpa Summit 2016, held February 22-24 in Las Vegas.